Click Here to Listen to Call Vance shared in his weekly email: "Not only do we have a ton of exciting stories to pass on from this week, you don’t wanna miss some of the awesome announcements that I’ve got to share. I also came up with a really simple way to explain our marketing plan in about a minute. For new Consultants, I think it’s absolutely wonderful that they can earn $600 in commissions and free product as they build their way to Senior. And for those of us at Silver and above, my calculator is coming up with about $820 just for making a run to 1500 each month." For those of us who have been going non-stop since Monday registering Customers and filling out 40% off orders, we probably feel exactly as Gwen Carter does. She, along with countless others, have been texting me all week sharing their excitement. Even though this promotion is only for Customers placing their first order, we’ve seen a massive increase in the number of Consultants who are joining and then immediately registering their own Customers. Team Hawaii or the Fujioka clan had three different Customers who register & ordered, then joined as Consultants so they could register Customers who followed their lead and did the same thing. This is going absolutely nuts! ', were Alan’s exact words. And it's only going to get better from here. Not that we'll see another promotion of this nature, but we're definitely going to see some really nice incentives for our Customers. They are the backbone of our business and it’s fantastic to know that we can give them some superior prices for the products that really do change lives. There are still two full days left to take advantage of this amazing offer and I urge you to connect with everyone that you’ve ever mentioned Nikken to. I mentioned the sale to a parent at Addi's 6th birthday party today. Even though this friend registered as a Customer months ago, she's still eligible since she never placed an order. After a few minutes chatting about products, she decided that the Waterfall would be her best first purchase. Do you think I can take a tax deduction for the birthday cupcakes?" With all the excitement taking place at the Eagle Expo this weekend, I thought it would only be right to bring a little bit of the event to you. The all-star line up of speakers are sure to yield some keen insight into the position we’re in right now." Dave Johnson and Dave Stoltzfus described our 40% discount with the words above. If we have been busy sharing this promotion with perspective Customers, then we should be able to reap the rewards for months to come. It should create an onslaught of orders and it definitely is an incredible tool unlike we’ve ever had before. Alan in Hawaii called me the other day in a panic because they’ve got Customers who are ready to register other Customers as soon as their first order goes in. We enjoyed a good laugh at the hysteria of what they’ve created and I assured him that it’ll all work out. I’ve attached the order form that needs to be submitted for our Customers to take advantage of this deal. 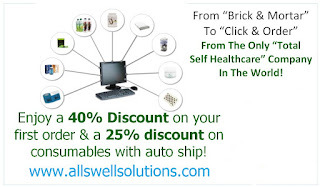 Remember that the goal is to add to our Customer base and create huge discounts for people as they start their wellness homes. And the best part is that they can do this at 15% less than what we can order the products for!
" A few weeks ago Elaine Connelly shared her story of how Nikken has saved her life twice. The first time when she was given a prescription for a wheelchair and just recently after a major heart surgery. Carol told me that as great as a 40% discount would be, she's gotta start rebuilding her health so she's ready for gardening season in a couple months. After heart surgery and suffering from a chronic back issue, she decided it was time to re-connect with Nikken. For those Customers that can wait till January 25th, a 40% discount is huge. That makes the Waterfall less than $200 including shipping and sales tax! 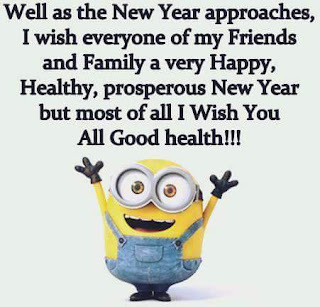 If you're like me, now is the time to connect with people that have been sitting on the fence to make that big purchase or start their wellness home. We've got ten days to let our friends know that now is the time to become a Customer. Please remember that this discount is for NEW CUSTOMERS ONLY! If they've registered and NOT placed an order, then they can take advantage of this discount. It is NOT designed for existing Customers or Consultants who want to take advantage of a good deal. The ideal is to register new Customers and connect them with our life-changing solutions. Here's a great example of someone who is doing just this. It started with a roll of DUK tape to help her daughter run without agony and two months later she earned nearly $2000 from sharing her excitement. Brody Craney and his team didn’t wait to see what Nikken was going to unveil two months ago after the prices were re-structured. That massive change was enough to empower them to really go for it. And go for it they did. The group generated 50,000 in volume more than the previous month! Brody has taken his background as an accomplished musician into the depths of his Nikken business. Regardless of the size of the instrument, every person plays a major part. People are the same way. Brody brings out the best of his team and his story is motivating. Greatest paradigm shift in the network marking industry. William Todd shared this statement on the leadership call this week. He was complimenting Ben Woodward and the team at Nikken for leading us through this major change. Starting January 11th, every new customer gets to take 40% off their first order and then 25% off their Autoship orders. And the more volume we generate from customers, the more free product we earn which we can sell for pure profit. She got really excited so we’re getting together in two days so she can learn more. Not only is this the greatest shift in our industry, it is a fantastic way for us to set new standards in what we can generate. By keeping the focus on 1500 we will have our families monthly consumables for free!" You are invited to view the link below from Nikken President, Ben Woodward. Join Nikken as we look ahead into the New Year and hear the company's vision for 2016. Ben shares exciting developments to be rolled out first in North America, and then in Nikken's other global markets throughout the year. Nikken is committed to providing you with the tools and information to grow your business and is looking forward to a very successful 2016 and beyond! In addition to viewing the video, please read through the detailed Retailing Questions and Answers below. We have made every effort to answer your questions. Please do not hesitate to contact us should you need further clarification. 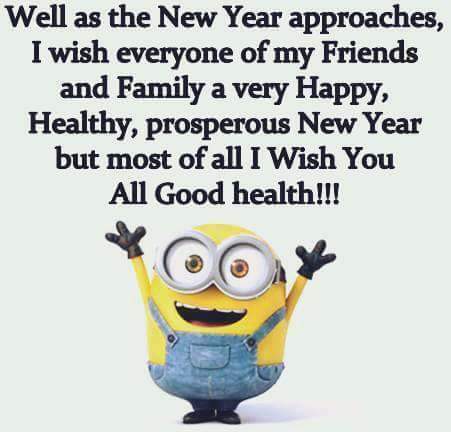 Here's to a successful and prosperous 2016! From everyone at Nikken, Happy New Year! Question: Nikken has established a strong new direction now with a clearer emphasis on retail activity. Why is that? Answer: There are a number of important reasons to support this plan. Firstly, we saw that a large number of people actually joined Nikken to receive a discount on product and a select group comparatively were interested in the business opportunity. Since most people recruited their customers to offer them better prices, they forfeited their income opportunity. That didn't make sense to us, so we have lowered the prices to remove the need to sign up wholesale buyers that are not interested in the business opportunity. We have also provided Personal Web Pages to every consultant to give them a platform to promote and sell the product to their community. Question: As of January 2016 I need to have at least 100 points in retail sales each month, correct? And do I get paid on it? Answer: Yes. All consultants will need to have at least 100 points of retail sales in a month to create their Qualified Personal Point Volume (QPPV). This replaces the need to create 100 points through personal consumption. This volume can come from one customer or several. Question: What counts as a retail sale? Answer: Any orders placed at retail pricing. This includes all PWP orders. Question: Do wholesale orders shipped to a customer count as a retail order? Answer: No. However, you can offer your customers discounts using the PWP product discount through your myNikken back office. Question: What if I have a number of people that I am placing an order for at one time. Is that one customer order or multiple customer orders? Answer: Nikken would encourage you to direct your customers to your personal web page to place their orders. Keep it as simple as possible. If you have multiple people placing an order with you to save on shipping costs - you can place it as a retail order, but it would count as a single retail order. Question: How do I manage products purchased for future retail sales? For example, if I want to buy inventory? Answer: Nikken would discourage you from buying inventory. Keep it simple and direct people to your website. You can place orders as retail orders if you wish in order to have product available for unplanned opportunities. Question: Can I place my own personal purchases as retail orders? Answer: Regulators frown upon personal purchases being used to count towards personal commissions and compensation plan benefits. Stay away from areas of regulatory concern and focus on healthy practices that grow your business the best way possible. Question: Let's say I really want to buy product for sampling or for inventory. This is a business expense so why can't it count for my volume? Answer: You will get paid on this volume, it just doesn't count towards 'Qualifying Volume.' You will get the rebates as normal when you achieve the qualification requirements. Please keep in mind also that the Nikken Rewards Point program can offer you points towards FREE product that you can use towards giveaways, sampling and demonstrating etc. Of course, you can enjoy them for yourself also or sell them and make a handsome profit. You have choice there - but you can definitely use those points towards business building activities without having the cost. Question: Are customer incentives available? Answer: Yes, there are 2 major incentives which will come into effect in early January for North America followed by their introduction in Europe. 1) Newly registered customer will receive 40% off their first order placed on your PWP. 2) Registered customers with Auto shipments under their account will receive a 25% discount from retail pricing on applicable consumable items. Retail Autoshipments that are not under a registered customer ID will be available at retail pricing and will not be discounted. Question: What about the five-retail sales rule? Answer: The five-retail sales rule is required for Silvers and above. It is an additional requirement to receive your leadership bonus. Those that are not Silvers do not need to be concerned about this rule yet. Answer: No, as a Silver or above you need to have at least 5 retail orders and at least 100 QPPV in retail sales to ensure you qualify for your rebates, overrides and leadership bonus. Ben Woodward references this ancient proverb in his eight minute new year message. 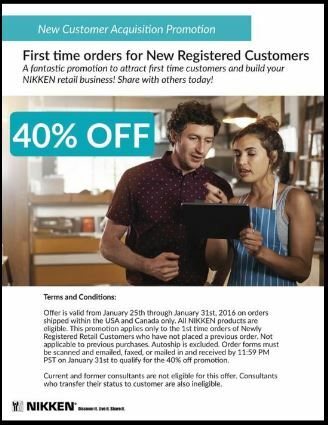 With our new Customer focus making it easier for people to get the products they want at really great prices, Nikken just allowed us to make the vision clearer with a 40% discount for their 1st order AND a 25% discount for consumables on Autoship. I’ve never been one to make lofty predictions or forecast grand achievements, but I can’t help but believe that if we’ll let others know what Nikken has announced for 2016, this could very well be a turning point year for so many of us.